Input text: The large pyramid is shiny and black. The pyramid is on the ground. 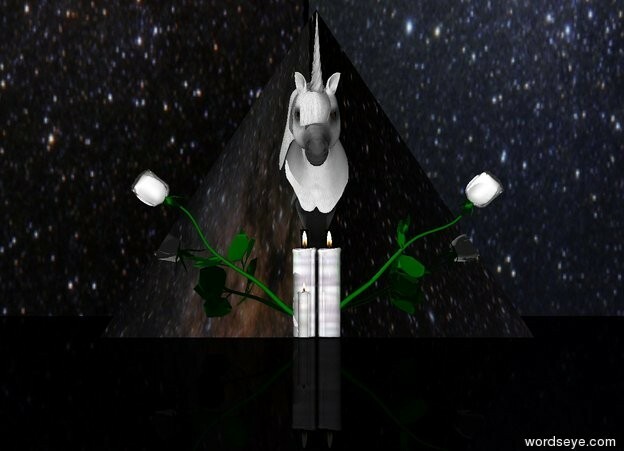 The very small unicorn is -1.77 feet in front of the pyramid. The small unicorn is on the ground. The first white flower is -2 inch in front of the pyramid. The first white flower is leaning 50 degrees to the right. The second white flower is -2 inch in front of the pyramid. The second white flower is leaning 50 degrees to the left. The ground is black. The sky is [stars]. The first glass candle is to the right of the first flower. The second glass candle is to the left of the second flower. The third small glass candle is in front of the second candle.